Being exposed to mold in your home can lead to various kinds of sickness. Health problems caused by mold are often difficult to track back to mold. But you don’t have to let it go that far. While it is a good practice to test a home when you purchase it, you should especially consider contacting the experts at HomeSpec to get a mold test done when you notice a musty odor, know about water damage or see mold (incl. discoloration of wall) in our SW Florida home. Call us now at 941-270-1349 or click here to request pricing and to schedule your mold testing. Does a water stain on a wall or ceiling surface automatically mean the home has mold? The short answer is maybe. Mold is a living organism that needs two things to live, water and food. 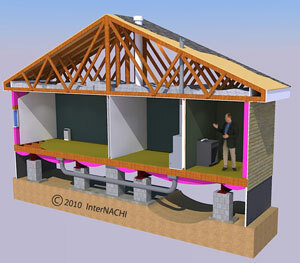 A leak in the roof or wall will provide the first thing, water. The material itself, gypsum, wood etc. provides the second, food. The third unknown is time. Mold can grow given the right conditions but does not always grow given its two needs. So does a stain mean the home has mold? It’s not known usually unless it can be confirmed visually and or a mold test is performed. HomeSpec can provide a mold test on your home if you feel it’s necessary and if your home is located in Charlotte, Sarasota, Desoto or Lee county. Can a mold test be performed on a home that is being lived in? Yes. If mold has been visually identified or a leak is identified that could be a source of mold or a musty smell is evident its advised that one has a mold sampling of the home conducted. This will be done by one of HomeSpec trained mold techs. A strictly calibrated mold air sampler will be brought to the home and samples of the areas of concern will be performed. Photos and descriptions of the suspected areas will be conducted and the mold canisters will be shipped to a lab with a chain of custody to determine what if any mold may be present. HomeSpec has partnered with Test All to then further analyze the results and produce a written report outlining the issues and remediation steps if any are needed. Mold testing can range from a few hundred dollars to as much as a thousand dollars depending on the homes size and the number of areas needed to be tested. Most tests are in the lower half of that range and HomeSpec will provide you with a cost estimate prior to conducting any testing. Where does HomeSpec provide this service? HomeSpec will provide mold tests in any of the cities it services. Port Charlotte, North Port, Englewood, Punta Gorda, Venice, Osprey, Sarasota, Siesta Key, Bradenton, Cape Coral, Arcadia and any cities in Lee, Charlotte, Sarasota and Desoto counties. I’ve had my home inspected and no mold was observed do I need to be concerned? Probably not, but mold testing is still a valuable test. By Florida state statute a home inspector’s responsibility is to conduct a visual noninvasive inspection for his or her client. This means only if mold was visible would it have been noted in the inspection report. Mold can be interior of a wall, under flooring or in attics and ducts without ever being visible. A properly conducted mold test can identify mold spores in the air too small to see. HomeSpec can conduct such a test if required.